A NOTE ON GÉRARD AUMONT By The Frater Superior – Zero Equals Two! Do what thou wilt shall be the whole of the Law.Gérard Aumont was born Gérard Marie Albert Aumont in Gabes, Tunisia on September 13, 1902 to Alfred Charles Jean and Eva Alphonsine (née Mauger) Aumont. He married Paulette Cazaentre in Marseilles on August 10, 1932; they had no children. His nephew is the well-known theatre, film and television actor Michel Aumont. He was only 20 when he met Crowley in his post-Cefalù exile in Tunisia, first appearing in Crowley’s diary on August 23, 1923: “Aumont called—he had already translated The Ghouls. Very intelligent youth—gets my ideas at once—picks the important aphorisms—but is terribly voluble.” Crowley’s diaries show that Aumont was an occasional lover. He translated The Diary of a Drug Fiend into French around 1924 — its manuscript was among in the Crowley papers shipped to America. During 1925–26 Crowley settled north of Tunis in La Marsya, and Aumont became his secretary. 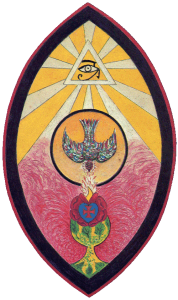 Crowley had recently issued his “Mediterranean Manifesto” and was then mounting his quixotic “World Teacher” campaign to promote himself as the alternative to Annie Besant’s designated “World Teacher,” Jiddu Krishnamurti. Unlike most of Crowley’s supporters, Aumont could write; he was a journalist by profession. He produced both pro-Crowley and anti-Krishnamurti propaganda in this period. In the period the Aumont essays were written, roughly 1923–27, Crowley was having difficulty having his own writing accepted for publication due to the press scandals in John Bull and The Sunday Express. His contributions to The English Review from the early 1920s were pseudonymous. Clearly, it was thought that articles extolling Crowley’s positive virtues and explaining his doctrines would have more credibility coming from someone other than himself. “The Secret Conference” (NS 94/24, published in The Heart of the Master and Other Papers (1992), pp. 1–10). “The Method of Thelema” (NS 94/4), published in The Revival of Magick and Other Essays (1998), pp. 176-83. “The Three Schools of Magick” (OS F1/6 and NS 94/5), published in Magick without Tears (1954), pp. 28–45; (1973), pp. 64–90. “Le Nouveau Messie” (OS F1/7 and NS 94/25). “The Black Messiah” (NS 91/12). Another contemporary essay may also be by Aumont; “The Master Therion: A Biographical Note” (NS 18/13, published in The Equinox III(10) (1986), pp. 13–18, and in The Heart of the Master and Other Papers (1992), pp. 11–21). Its title and voice suggest that Crowley was not the author. No essays attributed to Aumont appear in the detailed catalog of the Crowley archive recovered from the Germer estate in 1975, although there was a Crowley/Germer file for Aumont that could have included typescripts; this file was lost in the 1978 burglary of the storage unit housing these papers. Detailed surviving catalogs of the OTO Archives by the Germers, and the later catalog by Phyllis Seckler, show that some papers from the Crowley-Germer archives survive today due to Grady McMurtry, Phyllis Seckler or Helen Parsons Smith having removed them before the second robbery of 1978. All three were senior members and IX° OTO trustees, and all exercised borrowing privileges to varying degrees. We can thank them for the survival of some material that would otherwise have been lost, “checked out” at the time of the final robbery. In The Unknown God (2003), p. 165, Martin P. Starr cites a typescript of Aumont’s essay “The Black Messiah” in the W.T. Smith papers. This copy is one of only two known (the other copy is cited above and discussed below). It probably had been Crowley’s copy from the old archive’s Aumont file, and probably only survived by being innocently out on loan to Smith’s widow Helen. Some of the Aumont essays have passages written in a style similar to Crowley’s; all incorporate his ideas to varying degrees, and a few do so to such a marked degree that they have doctrinal standing. Several early students and editors, including Israel Regardie, Gerald Yorke, Martin P. Starr and myself, have tended to assume that the Aumont essays had been ghost-written by Crowley. I have published several of them as such, as cited above. My assumption had always been that Crowley attributed their authorship to Aumont in order to give the appearance that someone was writing about him; also, perhaps, he was trying to get around the “embargo” on publishing his work that he believed to be in effect after the negative newspaper coverage of 1922–23. This opinion was naturally reinforced by the fact that some surviving typescripts have edits and corrections in Crowley’s hand, though others show edits by someone else, presumably Aumont. With all respect for Regardie, I find that he had little basis for making such an assessment of Aumont. He was only 21 when they met, had not been studying Crowley for very long, and did not speak French; there is also no indication that he had read any of Aumont’s other writings. Regardie had many opportunities to ask Crowley whether he, or Aumont, really wrote the essays credited to Aumont, but sadly, it is clear that he never did so. I have come to accept Aumont’s authorship of these essays, although I allow that some of them were almost certainly written from notes of interviews and discussions with Crowley. I also think that Crowley edited the final form of those essays intended for publication in English, probably working from Aumont’s rough English translation of his original French, to judge from some of the surviving working drafts discussed below. Aumont’s published journalism shows that he was a capable writer, even in his twenties, and there are stylistic features in the essays that are decidedly unlike Crowley; some of the similarities mentioned by Regardie may have been due to imitation. As a professional journalist, it seems improbable that Aumont would readily acquiesce in lending his name to a half-dozen or more works that he didn’t write. And there was no need for subterfuge—Crowley never had difficulty inventing pseudonyms; he famously used dozens of them. It is otherwise almost unheard of for Crowley to write under the name of a living colleague. The only other instance that comes readily to mind is some short fiction on Russian themes credited to Marie Lavroff; these were probably true collaborations. Finally, there is Crowley’s later handling of the Aumont contribution to Magick without Tears: he persisted in crediting the “The Three Schools of Magick” to Aumont some twenty years after it was written. While the language shows that this could not have been Crowley’s work, the essay’s crude style and overtly prejudiced substance—which I will not reproduce here as I find it offensive—is also wrong for Crowley, who left a very large body of writing for textual comparison. Notably, the pejorative usage “negroid” recurs in another Aumont essay, “The Three Schools of Magick.” Crowley published a few unfortunate remarks, but the sort of crude racial bias found in “The Black Messiah” would have been a complete outlier for him; I cannot reconcile the views expressed in that essay with all I know of Crowley’s actual thinking. However, the sorts of racist attitudes expressed, and the ready willingness to express them, were not unusual for someone with Aumont’s background. Such attitudes were common in the French colonies where he was born and raised. In Aumont’s defense, it should be noted that he was very young—in his early twenties—when he wrote “The Black Messiah.” I have not found anything comparably detrimental in his published writings that I have traced. Also, there no evidence that he became a fascist, Vichy collaborator or Nazi sympathizer—and he would have had ample opportunity to do so, especially during the 1942–43 German occupation of Tunisia. On the contrary, Aumont and his wife concealed a Jewish friend from the Nazis—the orientalist painter Alexandre Roubtzoff (d. 1949), whose career he had helped launch in 1922 with an article in Dépêche Tunisienne. Aumont profiled Roubtzoff again as late as 1938 in the magazine Tunisie, at a time when it took real courage to do so. Aumont died in Tunis, age 73, on December 27, 1975. With assistance from Phanes X° of the Grand Lodge of Italy, and the sympathetic cooperation of Aumont’s family, OTO recently purchased a full assignment of Aumont’s literary copyrights. Our ownership of his rights will allow us to republish Magick without Tears with a joint author’s credit to Aumont, properly recognizing the three chapters he contributed to the book for the first time. It will also give our legal department basis for inhibiting the online dissemination of disinformation about Crowley pertaining to Aumont and his unfortunate essay “The Black Messiah” (which remains in worldwide copyright through at least the end of 2045). This will give OTO basis for legally countering recent attempts by far-right political extremists to co-opt Crowley — a unjustifiably cynical exercise that should make any right-thinking wise guy shake his head in sorrow.